Make yourself at home in one of the 192 air-conditioned rooms featuring refrigerators and iPod docking stations. Your room comes with a pillowtop bed. Wired and wireless Internet access is complimentary, while 32-inch LCD televisions with cable programming provide entertainment. Bathrooms have complimentary toiletries and hair dryers. Enjoy a meal at the restaurant or snacks in the condo's coffee shop/café. Quench your thirst with your favorite drink at the bar/lounge. After a day on the slopes, relax in one of the 3 spa tubs. This hotel also features complimentary wireless Internet access, concierge services, and babysitting/childcare (surcharge). Getting to nearby attractions is a breeze with the complimentary area shuttle that operates within 3 km. 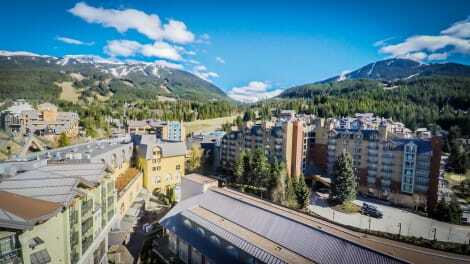 Nestled at the base of Blackcomb Mountain, Whistler's landmark ski-in ski-out hotel and BC golf resort, Fairmont Chateau Whistler defines mountain luxury. Naturally spectacular, Fairmont Chateau Whistler resort delivers an ideal setting for families, meetings and weddings alike. Combining classic elegance and a modern alpine setting, this award-winning Whistler hotel showcases exceptional dining and full resort amenities. At ResortQuest at Whistler Peak Lodge, enjoy a satisfying meal at the restaurant. Make yourself at home in one of the 41 air-conditioned rooms featuring fireplaces and flat-screen televisions. Digital programming and iPod docking stations are provided for your entertainment, while complimentary wireless Internet access keeps you connected. Conveniences include laptop-compatible safes and refrigerators, as well as phones with free local calls. Grab a bite to eat at one of the hotel's many dining establishments, which include 4 restaurants and a coffee shop/café. Relax with a refreshing drink at one of the 2 bars/lounges. Enjoy the convenience of ski-in/ski-out access at this hotel, which also features a health club. This hotel also features complimentary wireless Internet access, concierge services, and babysitting/childcare (surcharge). Enjoy a satisfying meal at Trattoria serving guests of Mountain Side Hotel Whistler by Executive. Make yourself at home in one of the 84 air-conditioned rooms featuring fireplaces and LCD televisions. Kitchenettes are outfitted with full-sized refrigerators/freezers, stovetops, and microwaves. Cable programming and iPod docking stations are provided for your entertainment, while complimentary wireless Internet access keeps you connected. Conveniences include coffee/tea makers and irons/ironing boards, as well as phones with free local calls. Featured amenities include dry cleaning/laundry services, a 24-hour front desk, and multilingual staff. Planning an event in Whistler? This aparthotel features 861 square feet (80 square meters) of event facilities. Self parking (subject to charges) is available onsite. Featured amenities include dry cleaning/laundry services, a 24-hour front desk, and luggage storage. This resort has 2 meeting rooms available for events. Self parking (subject to charges) is available onsite. lastminute.com has a fantastic range of hotels in Whistler, with everything from cheap hotels to luxurious five star accommodation available. We like to live up to our last minute name so remember you can book any one of our excellent Whistler hotels up until midnight and stay the same night.